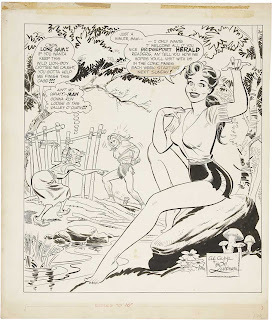 A friend of mine, Karl-Erik Lindkvist, just picked up a piece of artwork from Jeff Shultz (One of the current Betty & Veronica/Archie atists.) that I just have to share with you. 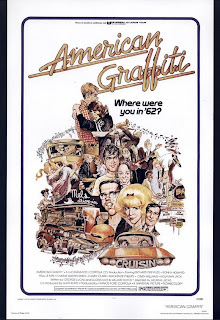 As you can see the commission was to do a version of the famous American Graffiti poster. 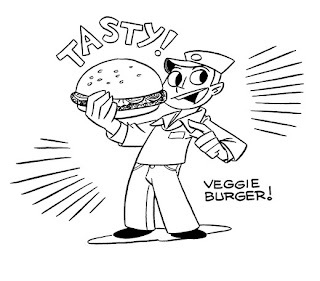 But with Archie characters instead. :) Enjoy! And here's the original poster by Drucker if you want to compare. And in the evenings I've been trying to catch up with my scanning and restoration projects. 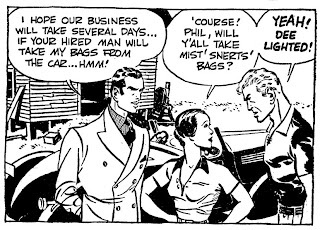 Besides Adventures of Patsy by Mel Graff I'm also going through my sets of Paul Fung stuff. The process I'm using is time consuming but the result gets pretty good. I then make a "new layer via copy". 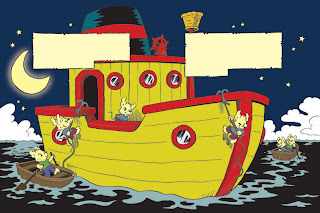 After that I drag the color background in the trash leavign me with only a black outline. I then change the image from color to grayscale. These are from 1941 and 1944. 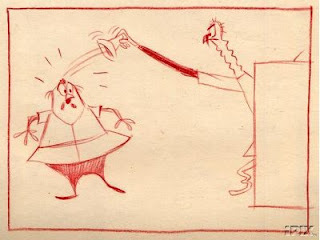 The one from 1944 is one of the very last things he drew before he died. More to come if there's interest. 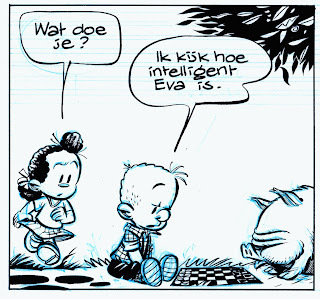 Today was the first day of work at Egmont after my vacation. But as usual I'll find time to blog about this and that. 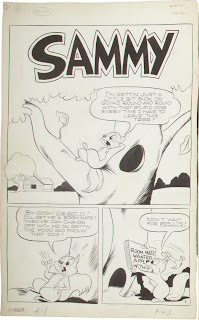 Got another unsigned Sangor Shop story that I own the original art to. I have no idea who drew this. 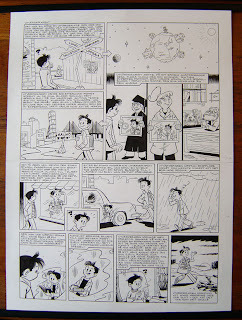 If anyone recognise the style from a signed story please let me know. 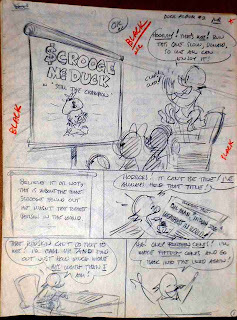 I've also started to scan more of my Adventures of Patsy dailies. 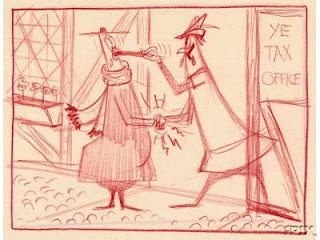 Here are some sample panels from mid 1936 that I scanned yesterday. 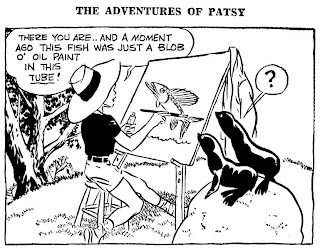 These are from before Patsy went to Hollywood to become a star. 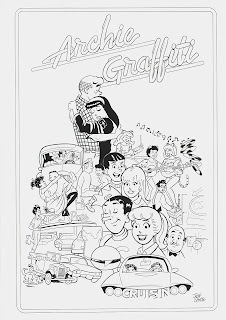 Mel Graff's best years as an artist was still ahead of him. Enjoy! 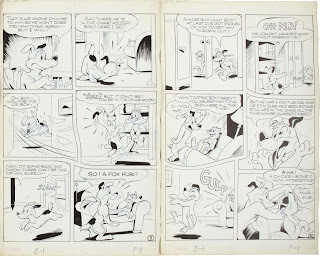 This Donald Duck "daily" just sold on eBay for $412. Labeled as a Manuel Gonzales original from the 50's or 60's. Well, In case the buyer reads this: This is a redrawn version of Al Taliaferros DD daily for 1942-03-11. Now, here's some more stuff that needs to be identified. 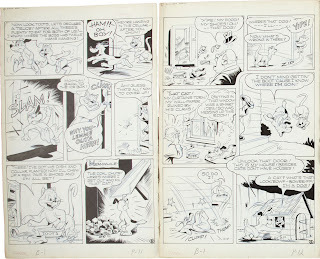 I bought a chunk of original pages last week and among them were these four "Puss and Toots" pages. 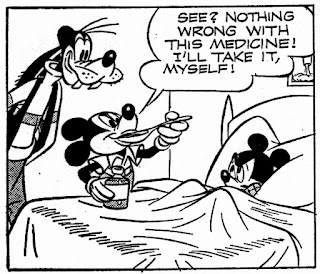 Also, if anyone can tell me where they were published - you deserve a gold medal. 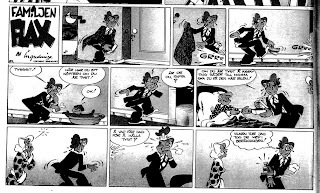 Hans Holm at Svenskt Seriearkiv (Swedish Comics Archive) is currently going through old weekly Swedish magazines, to index the comics published there. The latest magazine to be indexed was "Veckorevyn"
(The Weekly Review). 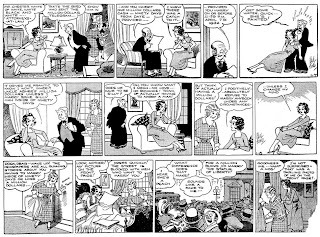 And there are a few "mystery strips" that needs identification. Maybe you can help? Artist, original title and country of origin needed. First out is Laura Larsson wich ran 1936-39 in Veckorevyn. 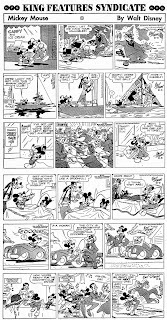 The page below is from 1936:44. 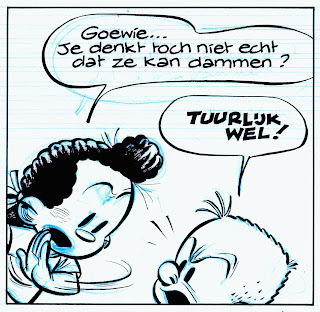 Update Sept 2015: Thanks to Lars Skovmand we now know that Laura Larsson is a Danish comic called Hanne Hansen made by Arne Ungermann. 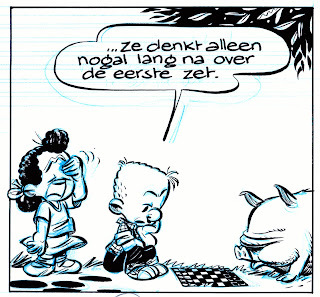 Thanks, Lars! And Familjen Flax that ran 1952-54. 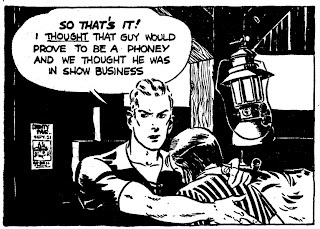 This sample is from 1954, issue 19. This artwork was supposed to be auctioned off at the cancelled Michael Jackson auction earlier this year. So are the both the drawing and the signature fakes? 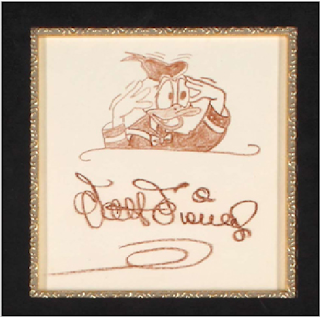 Or was the traced drawing actually signed by Disney to a fan? Buyer beware... forgeries are to be found everywhere. 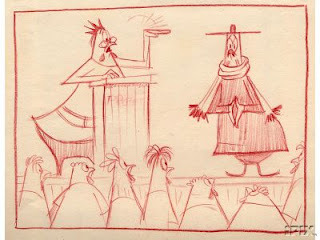 Today I'm posting a few odd Disney items I've found on the net. 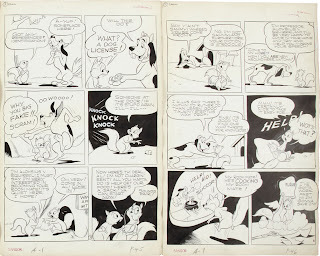 First a set of drawings that I saw on eBay. 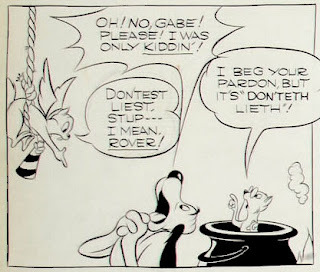 The seller credited them to T.Hee and I guess these are from the unproduced Disney film "Chanticleer and the Fox"? 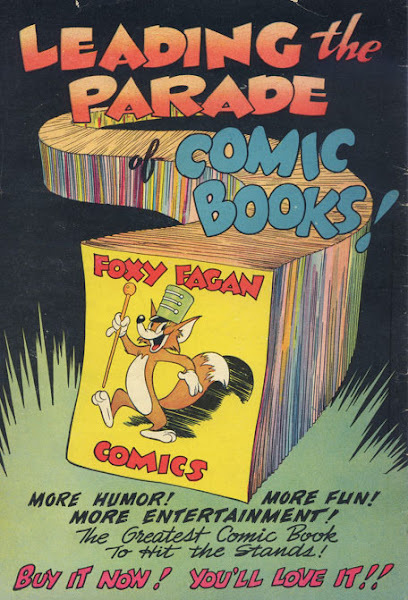 Now, that's the one unproduced feature that I'd really would like to see a coffee table book devoted to. 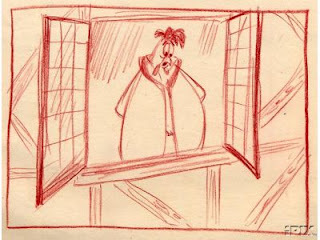 I just hope there's still artwork left in the Walt Disney Archives to make that possible. One of the great things about having a blog is all the people with similar interests who gets in touch. Last week I got a mail from Pat Thompson. 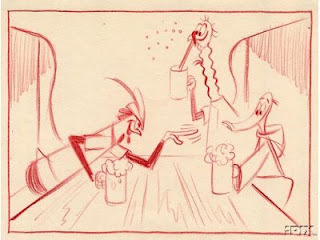 Back in 1956 she and her sister Peggy sent Bob Lubbers a design for a new dress for Long Sam. And what a reply they got! 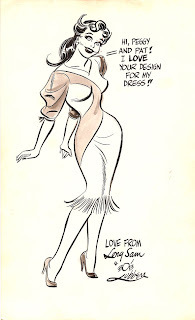 An original drawing of Long Sam in the dress they designed! 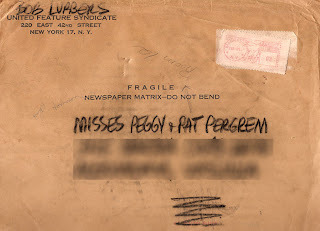 Pat still has both the original mailing envelope and the artwork and has allowed me to post them here. Enjoy! 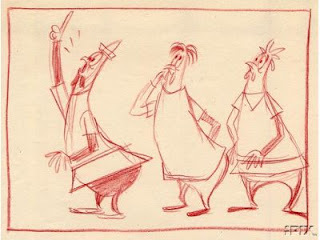 For more Bob Lubbers artwork use the label below. 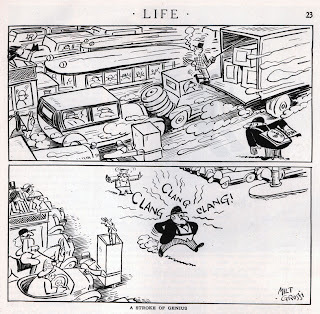 Milt Gross from Life (Pedestrians' number) September 24, 1925. What a genius! 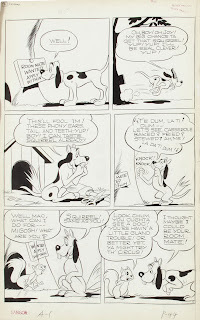 Want more Milt Gross right now? Just click HERE for some Banana Oil and more! 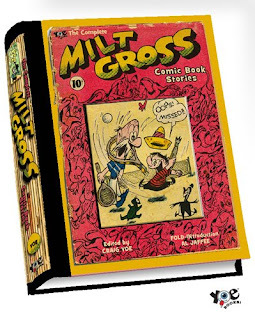 And watch out for the Milt Gross book this fall! 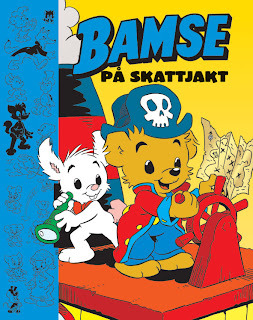 The title is "Bamse på skattjakt" ("Bamse on a treasure hunt") and will be available in bookstores here in Sweden and via Adlibris. 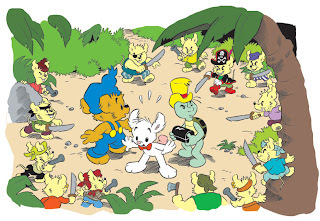 The book is based upon a comic book story from 2006. 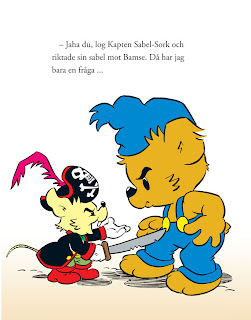 (While I've written the script for this book the comic book was plotted by me and scripted by the very talented Mårten Melin) The artwork in the book is by Lars Bällsten with inks by Bernt Hanson. Here are some samples. Enjoy! The rain is pouring down here in Sweden, so I spend the first day of my vacation indoors. Ho and hum. 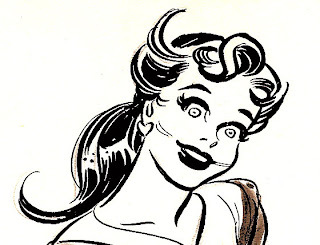 But there's stuff to be done, comics to be drawn and coffee to drink so I don't really mind. 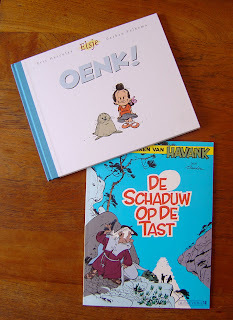 It contained both the special edition of Hercules and Valkema's new Elsje book and Danier's new Havank! 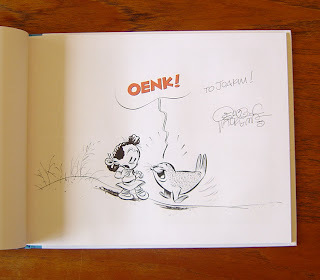 The Elsje book contained some original artwork drawn on the title page! Thanks, Gerben! And so did the Havank album! 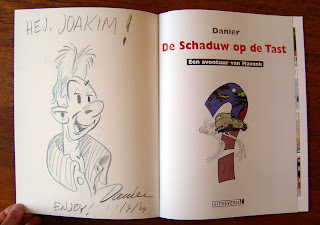 Thanks, Daan! 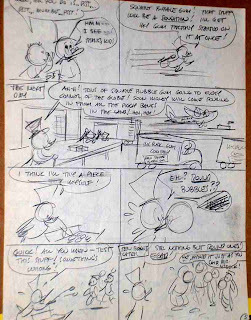 And to my surprise there was an original Elsje daily in the package!!! 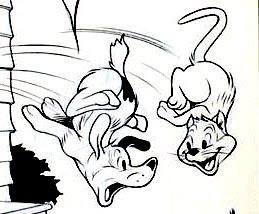 Just so you can see the fine details in the inking here are close ups of the panels. Enjoy!